Assortment of Early and Middle Stone Age tools found in the Olorgesailie Basin, Kenya. The tool at left is a hand axe. This early Stone Age hand axe was excavated at Olorgesailie, Kenya. A chemical analysis of the stone shows it was made with locally available rocks. Rick Potts, director of the National Museum of Natural History's Human Origins Program at the Smithsonian. He has been excavating in the Southern Rift Valley in Kenya since the 1980s. In this Olorgesailie Basin excavation site, red ocher pigments were found with Middle Stone Age artifacts. This is the earliest evidence of the extraction and use of pigments among ancient humans. The hand axe was a multipurpose tool used by our ancestors for chopping up branches and carcasses as well as digging for tubers. They remained unchanged for several hundred thousand years. 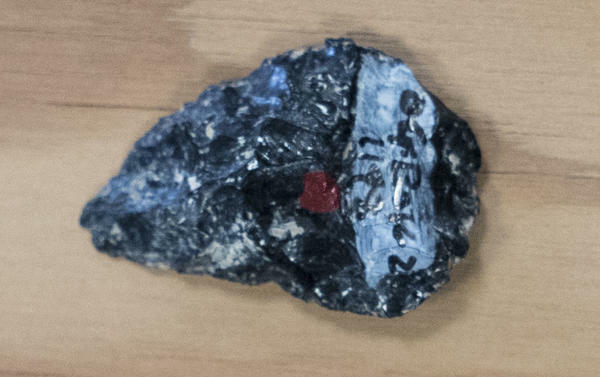 Obsidian rock found at Olorgesailie was originally brought by the ancient humans from distant places, some as far away as 50 miles from the site. Scientists think this is evidence of a larger social network of groups of ancient people who stayed in touch and exchanged obsidian and other resources. A small stone point made of non-local obsidian. The chemical composition of the artifact matches obsidian sources as far as 55 miles away. Red rock found on the site. There is evidence that the rock was drilled to extract its red pigment. "I think of the hand axes as the Swiss army knife of the Stone Age," says paleoanthropologist Rick Potts, director of the Human Origins program at the Smithsonian Museum of Natural History and one of the lead scientists in a new study by a team of international scientists. The researchers also found that the next technological revolution, marking the beginning of the Middle Stone Age happened tens of thousands of years earlier than previously thought. And the researchers think that long periods of stress from repeated earthquakes and cycles of drought and heavy rains may have pushed these early humans to partner up with neighboring communities to come up with ways to cope. The team was digging in a region called Olorgesailie in southern Kenya, an area filled with layers of sediment dating back 1.2 million years. The oldest stone tools discovered there are characteristic of what's called the Acheulian culture of the Early Stone Age and consisted mostly of the hand axes. In addition to branch- and carcass-chopping, the axes were likely used to dig for water to drink or tubers to eat. The carcasses probably belonged to large animals like the giant (now extinct) ancestors of hippos, elephants and wild pigs that roamed the grasslands back then. Potts says the ancient humans of that time likely scavenged dead animals, as their heavy, clunky hand axes wouldn't have served well for hunting big game. "These are very large tools," he says. "They might have been thrown but not very accurately." Nevertheless, these hand axes served the ancient humans well for several hundred thousand years — from 1.2 million years ago to 500,000 years ago — and the technology remained largely unchanged during the time. But around 320,000 years ago, the ancient humans seem to have switched to an entirely new technology. 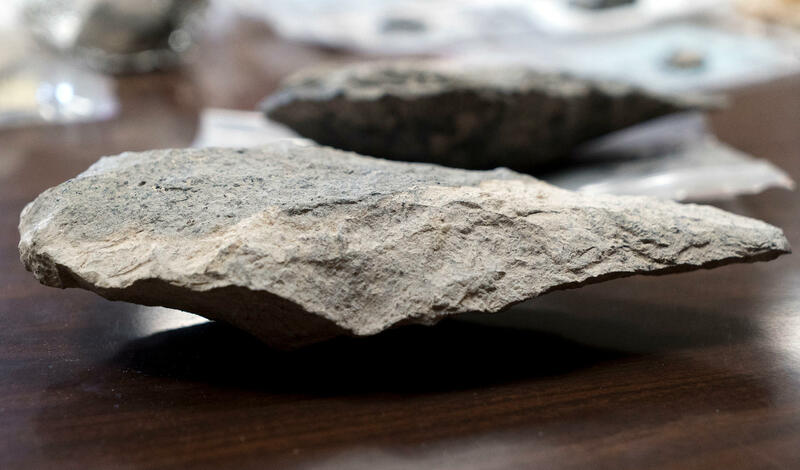 The scientists found numerous smaller, flatter, sharper stone tools. 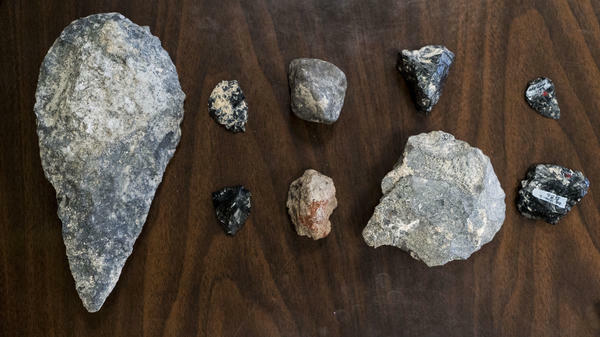 "We see a smaller technology, a more diverse series of stone tools," says Potts. These tools were designed for specific purposes — some were used as blades, some as scrapers or spear heads. The scientists report their findings in three new studies published Thursday in the journal Science. "In Olorgesailie, you have the only record of the last million years in Africa," says Marta Mirazon Lahr, a paleoanthropologist who wasn't involved in the new study. And it's "the earliest ever documented Middle Stone Age in the whole continent." The new studies also show that by 320,000 years ago this technology was well established in the region, suggesting that human ancestors likely started developing it even earlier, she says. "The technology they have is not a crude, early version of the Middle Stone Age. It is the full-blown Middle Stone Age," Lahr says. "They have stone tools that are small, that are prepared and retouched, that are made with technique thought to come hundreds of thousands of years later." The diversity of stone tools from the Middle Stone Age suggests advanced thinking and planning. "The flakes are being much more carefully prepared for a particular purpose," says Alison Brooks, an anthropologist at George Washington University and an author of the three studies. "They are fairly small in size, compared to the technology of earlier people. And in addition, they are made with much finer grained material," which allowed them to better control shapes and sizes of the stone tools. "We see the ability to produce small triangular points, that look like they were projectile points," says Potts. "They were tapered at the end, so that could have been put on the shaft of something that flew through the air." In other words, a potentially lethal spear. So our ancestors likely shifted from scavenging to hunting. An analysis of the fossilized animal bones found in the sediments show that people in that period were eating a range of mammals — which were by now much smaller, and closer in size to the animals of today — including hares, rabbits and springbok and even a couple of species of birds and fishes, says Brooks. And they weren't just picking up nearby stones to create their weapons. Earlier hand axes were made primarily from volcanic basalt, sourced within 2 to 2.5 miles of where these humans lived. The latter weapons were made of stones like obsidian, which originated far from Olorgesailie. 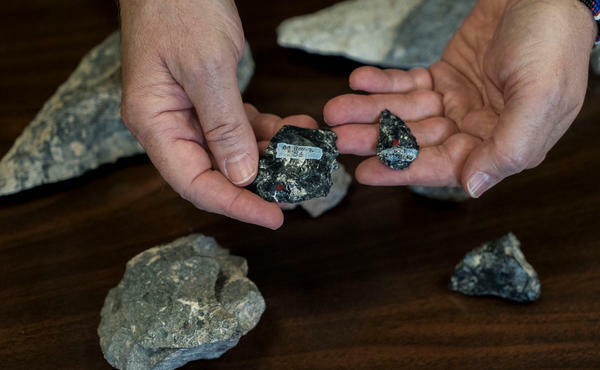 "That black obsidian, that rare rock was being transported, brought in in chunks, from 15 to 30 miles away," says Potts. "We have a couple of rocks that were brought from up to 55 miles away." These distances are far greater than what modern-day hunter gatherers travel over the course of a year, he says. "They weren't just traveling long distances and chipping rocks as they go," he adds. "If they did that, then there would have just been small chips of obsidian left at the archaeological sites where we dig. Instead we see large pieces of raw material coming in. The rocks were shaped at Olorgesaile itself." That kind of exchange of raw materials is a tell-tale sign of exchange between different groups of people, the scientists say. "In the Middle Stone Age, we begin to see the early stages of social networks, of being aware of another group and exchanging rocks over longer distances." 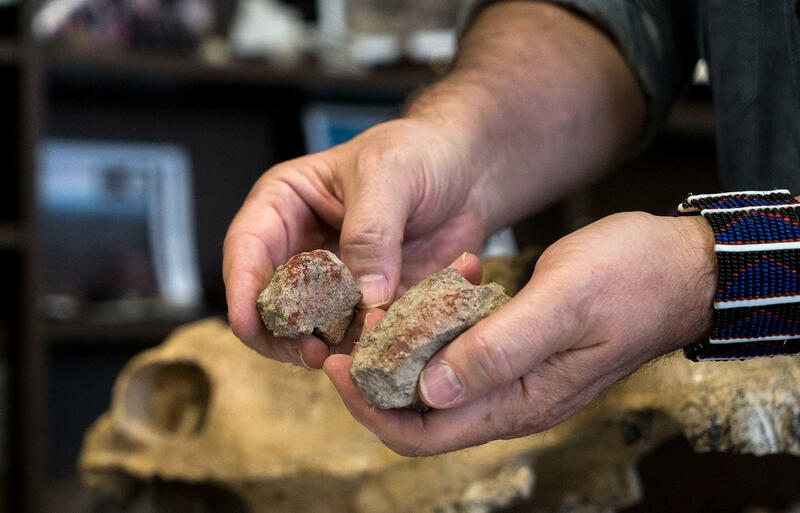 Potts and his colleagues also find evidence of exchange of brightly colored red and black rocks that were then drilled into, possibly to extract pigment. This is the earliest evidence of the extraction of pigments, says Lahr. It's also evidence of a complex culture, where the ancient humans probably used pigments symbolically — perhaps to paint themselves, or their hides, or weapons. And where different groups exchanged raw materials (and possibly food). There's that same kind of exchange today, says Brooks, referring to hunter gatherer groups like the Hadza people of northern Tanzania. "They deliberately maintain distant contacts with people in these other groups," she says. They have strategies to maintain these contacts — either by encouraging their children to marry into these other groups, or they take trips to visit the groups, to maintain ties by giving gifts. "It's a way of building up these distant contacts, which are extremely important for their survival." During times of stress, when food or water is scarce, people from one group can disperse and take shelter with other groups that they've cultivated a relationship with. "So the networks are like money in the bank, or wheat in your silo or cows in your barn," says Brooks. "They don't have any other way of saving for a rainy day." 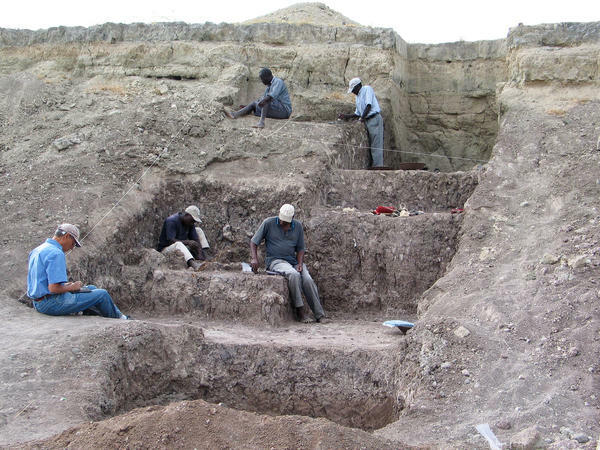 And as she and her colleagues show, the beginning of the Middle Stone Age in Kenya was preceded by a long and tumultuous phase in the region. "Things were going haywire, in terms of the development of geological faults, earthquake activity that moved the low places high and the high places low," says Potts. "It changed the shape of the landscape." This was accompanied by repeated cycles of droughts and high rainfall. "And it is precisely during those time periods that we expect to see hunting and gathering people to move further distances," says Potts, "and to begin to nurture relationships with groups beyond their own group." It is no different than what humans all over the world do today, he adds. When times are tough, we look for greener pastures. The archaeological records from the Middle Stone Age at Olorgesailie reveal "the roots of that kind of migration," he says. 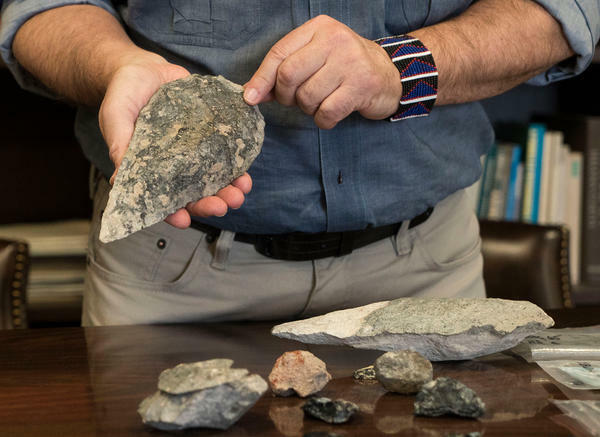 Scientists excavating in Kenya have discovered an impressive array of stone tools that date back to over 1 million years ago. That's even before B.J. Leiderman wrote our theme music. As NPR's Rhitu Chatterjee reports, the discovery points to an early technological revolution. RHITU CHATTERJEE, BYLINE: The oldest stone tools discovered at a site called Olorgesailie in southern Kenya are 1.2 million years old. They were big, clunky cutting devices called hand axes. RICK POTTS: I think of the hand axes as kind of like the swiss army knife of the Stone Age. 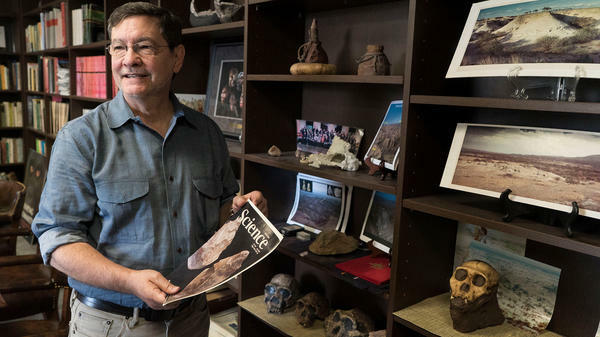 CHATTERJEE: Rick Potts is a paleoanthropologist with the Smithsonian Museum of Natural History and part of the team that made the discovery. He says the hand axes could be used for everything - chopping branches to digging for water to slicing through the carcasses of the giant elephants and hippos that roamed the grasslands back then. These axes were the only game in town for hundreds of thousands of years until about 320,000 years ago, when new stone tools took over. POTTS: We see a smaller technology, a more diverse series of stone tools. CHATTERJEE: Like your laptop, these stone tools got sleeker, lighter, and they were of different shapes and sizes. Some served as blades, others as knives or spearheads. MARTA MIRAZON LAHR: There's a revolution in the stone tool making. CHATTERJEE: That's Marta Mirazon Lahr, a paleoanthropologist at the University of Cambridge who wasn't involved in the three new studies published in this week's journal Science. LAHR: There's stone tools that are small. There's stone tools that are made with techniques that are thought to come hundreds of thousands of years later that produce little blades. And they're all there already at 320,000. CHATTERJEE: Three hundred and twenty thousand years ago was before modern humans are thought to have appeared on the scene, so these tools would have been made by an unknown ancestor. Whoever it was, their tech revolution paved the way for our evolution. Rhitu Chatterjee, NPR News. Transcript provided by NPR, Copyright NPR.